Model S4 PIONEER BRUKER aXS, X-ray fluorescence analysis is a fast, non-destructive and environmentally friendly analysis method with very high accuracy and reproducibility. All elements of the periodic table from Beryllium to Uranium can be measured qualitatively, semiquantitatively and quantitatively in powders, solids and liquids. Only the elemental composition (of the surface layer of the sample – in case of solid samples) – Be to U can be easily determined. For solution state/liquid samples much care is to be taken lest the X-ray source gets damaged due to spilling of the sample by the rupture of the mylar film window of the solution cell. In general XRF DOES NOT give the oxidation state information of elements except in case of low Z elements eg for Sulphur, if we use very high resolution mode of measurements, one can at least in principle, differentiate between sulphide and sulphate group. For details on the charges and for more information on the facilities available contact the operator in charge. Rhodium is used as the standard anode material. The tube and generator are designed for a permanent output of 4 kW. Besides the standard collimators with aperture angles of 0.15°; and 0.46° two additional collimators can be installed to optimize the measurement parameters, depending on the application. A 0.077° collimator is available for high resolution measurements (e.g. with LiF (420). Collimators with a low resolution (e.g.1.5°– 2.0°) are advantageous for light elements such as Be, B and C as the OVO-Multilayer’s angle resolution is limited. 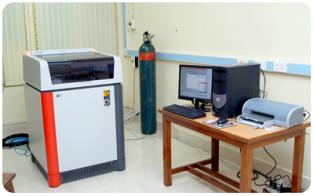 XRF analysis is a physical method which directly analyses almost all chemical elements of the periodic system in solids, powders or liquids. These materials may be solids such as glass, ceramics, metal, rocks, coal, plastic or liquids, like petrol, oils, paints, solutions, blood or even wine. Analysis of granitic rocks, for quality control in the manufacture of metals and alloys, determination of lead and bromine in aviation gasoline samples, determination of calcium, barium and zinc in lubricating oils, for the determination of pigments in paint samples, analysis of atmospheric pollutants, determination of elements heavier than sodium in rocks and soil encountered near the landing sight of the Mars Pathfinder mission (particle-induced X-ray emission).